In spite at first glance the story appearing to be an April’s Fool Day joke, rather it was spurred by a very serious query from a young lady who wanted to why the police did not use cats. 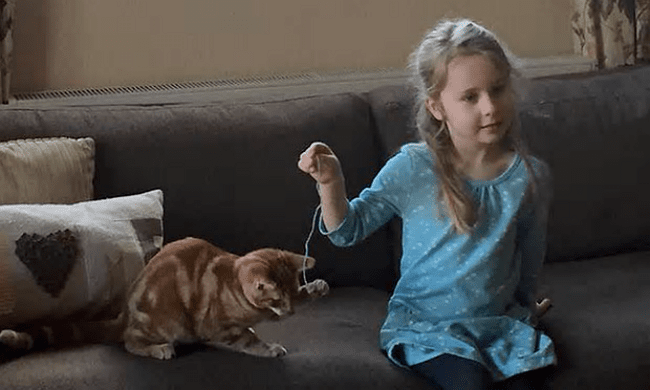 In spite at first glance the story appearing to be an April’s Fool Day joke, rather it was spurred by a very serious query from a young lady who wanted to why the police did not use cats. 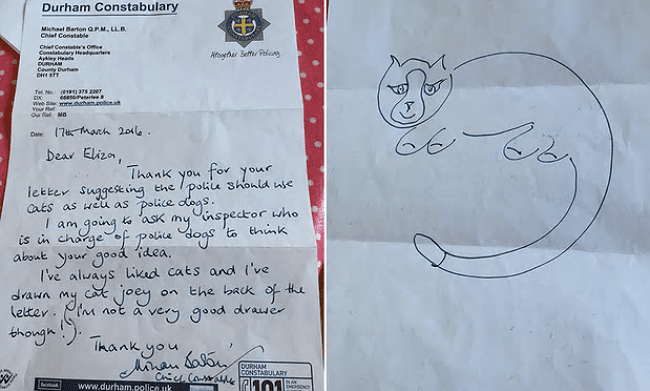 Five-year-old Eliza Adamson-Hopper, with the aid of her parents who kindly typed up her dictated letter, thought the chief constable should consider cats joining the police force. As parents would, they did advise their daughter that the police were busy, so there may be no reply, but certainly it was well worth sharing her idea. To her parents surprise, a response did arrive and it wasn’t a standard form letter either. In fact, Mike Barton, the Durham police chief from the county in which Eliza lives, wrote her a thoughtful, handwritten letter, thanking her for he suggestion and sharing he would pass along the idea. On the back of his letter, Barton included a hand drawn rendering of his own cat, Joey. It turns out, however, that at least one cat has been an active part of the force. 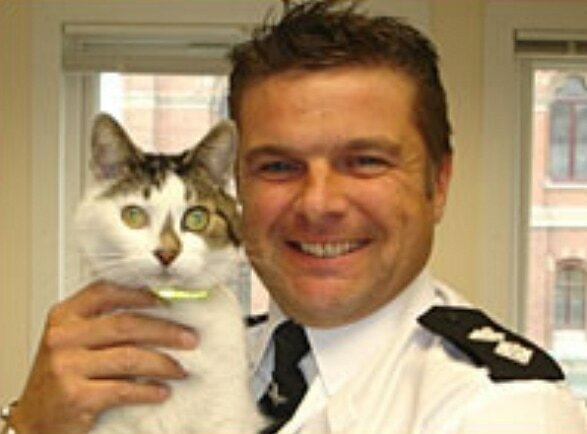 Chief Mouser PC Tizer, was adopted by the British transport police from the Cats Protection charity, and was responsible for keeping the Kings Cross station vermin-free. Eliza should be ecstatic to hear that.